Fill the future up with them. Sometimes, in the shortest moments, in the simplest of places, there can be the most memorable and greatest of delights. 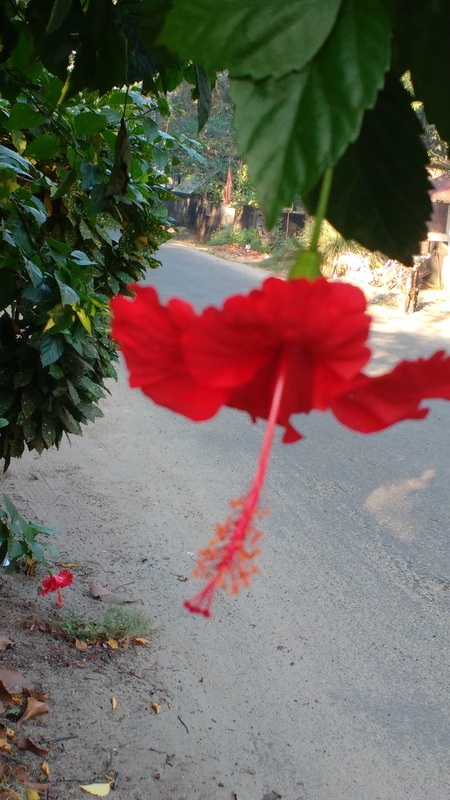 On a modest of country street, for just a few earthly seconds, I had the company of Sheer Beauty alongside me, Swinging its bold confidence on the path to a Keralan beach in Indian Winter, one could understand how such an exotic, frilly and fluttery blossom comes to symbolise the epitomy of bliss of an eternal paradise. We all try to hold onto that which is beautiful for as long as possible. How easy it is to just enjoy an idyllic view of my local English farm in any season. But on a sunny Spring day, it is through these telling patterns that one’s gaze directs the memories to the dedication of those farmers who invisibly till the land and keeps its form and its peace. An afternoon at the Birmingham Botanical Gardens takes on slow walking in a glass box. Through the geraniums, amaryllis, there are many other vibrant stories of the Exotica to enjoy, Time stops when joy indulges the spirit. As one learns that not all loops are to do with knitting, and that red shiny tubes are not only made of plastic, the truth becomes apparent – that the world is alive and unique, totally wierd, totally wired, multi-dimensional and necessary. And with no limits on AMAZING. End of March and I have stored up my excitement on recall of what marvellous magnolia is just about to reliably do. It is the tree which wears the delicate crown for Spring’s coronation across England and the rest of the UK. The hairy green-grey buds will untighten, always in a secret ceremony, to burst into a cloud of blushly pink. That is baby pink with softly skin petals, not made to last, but to behold. Now with the utmost certainty, I also know that everybody who will pass and take to glance at these sturdy lotus like blossoms will all feel a little bit richer, whether one is in a pushchair or runner, These are peaceful emblems, positioned to be in higher places than we can reach. That must be Aspiration at work. It’s about another week before this task will be complete and then it will be fully visible, and this year, that means perfectly timed for Easter.